Yes, I kept repeating that word over and over during my all-too-brief week with this outrageous 21st century muscle car. It all started when the person that dropped off the car said, “you get the red key!” At first, I didn’t get it, then I saw what was parked outside and I simply smiled. What does the red key do? Read on. The 60’s was a golden age for muscle cars, while the 70’s was the start of the malaise-era for the beloved automobile which lasted until the late 90’s. 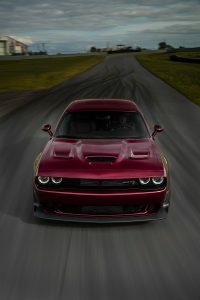 Luckily in the 1st part of the 21st century, maverick brands such as Dodge, wanted to re-ignite the muscle car fever of the 60’s and did so quite successfully with the Challenger and Charger with the SRT and Hellcat versions. 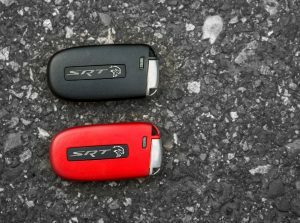 In the last couple of years, new variations have been offered, namely the low production Demon (Sold Out) and the slightly detuned SRT 392 version. Bravo FCA and the late, Sergio Marchionne for doing this! The main visual difference, are the 3.5” wide fender flares, which create a sportier appearance to this monster. 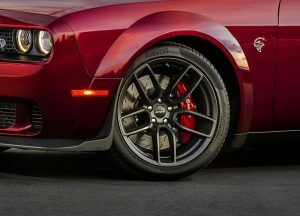 Wheels are also larger, at 11 inches, a full one inch wider than the standard Hellcat’s wheels. It also has (EPS) Electronic Power Steering, which improves handling and acceleration. Approaching the Challenger Hellcat is dramatic. It’s a big, bold and aggressive coupe. The stance, the brakes, the wheels and of course, the fender flares add further drama to the look. The front fascia is totally retro, harking back to the original Challenger yet looking modern and fresh. 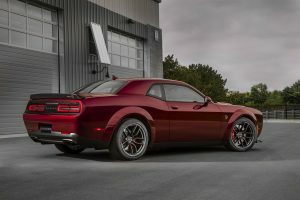 The back of the car, features a trunk mounted black spoiler as well as oval-like exhaust tips that are not over the top yet still say, “I mean business.” Opening the driver’s door of the Challenger, instantly reminds me of the popular 60’s large, personal coupes, featuring large hoods and trunks and a reduced passenger compartment design. Once inside, you are greeted by a pair of sportier seats as well as a superbly appointed cabin. 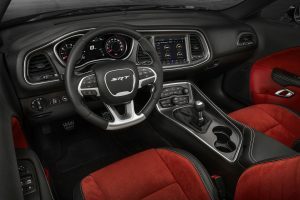 The large infotainment system is easy to use, featuring sub-menus for when you want access to the maximum 707 HP under the hood, (if you have the red key). 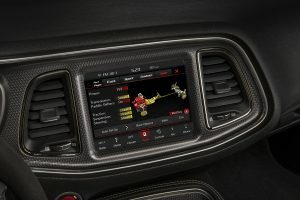 There are all kinds of information offered on the screen, such as a launch display, G forces, braking distance, boost and other engine parameters. 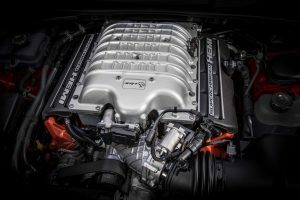 Starting the Hellcat is a dramatic event all its own. Press the start push button and the starter engages followed by a glorious baritone sound from the legendary Hemi V8 engine. Blip the throttle and by the sound, you know you are driving something special. Our test car had the 8-speed automatic transmission which was smooth in all gears. This car has so much torque, that you do need to be mindful when going into Drive (D). The car will start moving and you do need to use the brake pedal to keep the speed in check. 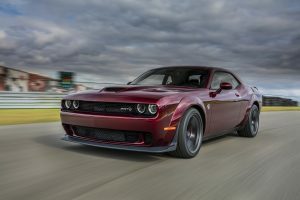 My initial impression when driving the Challenger Hellcat is one of “Wow, this is a big car!” It’s quite noticeable when parking in a tight spot or entering a house garage. So how does it drive? Easy to describe: It drives how a modern muscle car should drive. Its direct, powerful and aggressive. Yes, at times I did feel that this car could easily get me into heaps of trouble with the law, so being prudent is even more important. The supercharged 6.2 liter, V8, sings a musical aria under full power which, as I write this, still gives me goose bumps just thinking about it. Pressing the accelerator pedal to the floor will give you an explosion of power all the way to redline in each of the eight gears. Simply orgasmic! Braking is equally impressive, thanks to the highly capable Brembo brakes in all four corners. Suspension and cornering feedback is surprisingly good for a car this size and weight, you do have to be mindful of modulating the throttle correctly around a corner otherwise it’s easy to lose traction. Would I own one? Absolutely yes! The Challenger SRT Hellcat Widebody is one of those cars you drive simply for the sheer joy of it. Can it be a good daily driver or commuter car? It can be and I did use it that way as well, but why would you want to sit in traffic and crawl and stop repeatedly for 30-40 minutes in an awesome car like this? This is something you take out early Sunday mornings when the road belongs to you and the Challenger SRT Hellcat. Yes, WOW is the perfect word to describe this modern muscle car.